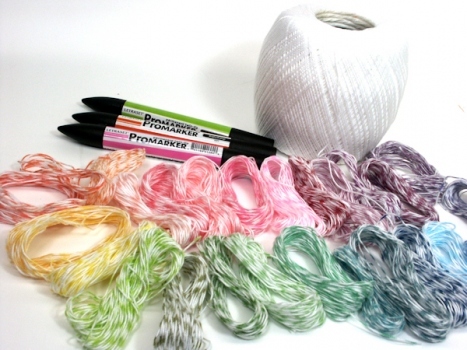 I love plain cotton thread (#10 crochet cotton) and have it in a bunch of different colors. I have even twisted a couple colors together to make it look more bakers twine-ish. But now that I have seen this tutorial from The Frugal Crafter, I have an even better way to to make faux Bakers Twine. You wrap it around a ruler and draw some vertical lines with a permanent marker and Voila! Your own homemade Baker's Twine. Poop! I just spent £15 on bakers twine when I had everything at hand to make my own! This is amazing, thanks for posting the video! Good! very useful! thanks for sharing! You are my hero... not only was a out of the twine i needed and didnt want to wait this morning but i had a huge roll of this cotton thread i have had for years just sitting here! Your my person of the day! OMG! I love you! I've been trying to justify spending $$$ on bakers twine and I have a huge roll of this lying around from a failed doily experiment. Thanks! That was great. I am going to use that for next Christmas packages. Who knew?! That was awesome!